Experience the dark powers and supernatural thrills within Blackwood Boarding School when Down a Dark Hall arrives on Blu-Ray (plus Digital), DVD, and Digital from Lionsgate’s Summit Entertainment. Based on the best-selling novel by Lois Duncan and produced by the author of The Twilight Saga, this terrifying young adult thriller features an all-star cast including AnnaSophia Robb, Isabelle Fuhrman, and Oscar nominee Uma Thurman (Best Supporting Actress, Pulp Fiction, 1994). 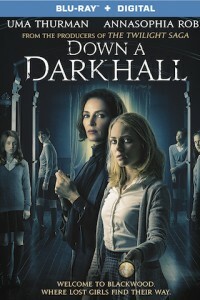 In the Down a Dark Hall DVD, Kit Gordy (AnnaSophia Robb), a difficult young girl, is sent to the mysterious Blackwood Boarding School when her heated temper becomes too much for her mother to handle. Once she arrives at Blackwood, Kit encounters eccentric headmistress Madame Duret (Uma Thurman) and meets the schools’ only other students, four young women also headed down a troubled path. While exploring the labyrinthine corridors of the school, Kit and her classmates discover that Blackwood Manor hides an age-old secret rooted in the paranormal.